The Ambassador , a career diplomat, whose job it is to maintain good relations between his country, the U.S. and Sierra Leone, is under duty to make these clarifications now and again because the U.S. would never want to be seen as taking sides in the politics of a host country. If indeed Ambassador Owens was quoted right in the statement above, he acted within the demands and responsibilities of his assignment. As the U.S Ambassador in Sierra Leone, it is his duty to assure the opposition that the U.S. had not taken any position of bias or prejudice against them. But did the ambasador really say that “the Presidential hopeful of the Sierra Leone Peoples Party (SLPP) has never been prevented from entering the United States of America” ? Don’t bank on it. Words may have been put in his mouth, SLPP newspapers-style ! ! ! MAADA BIO : HE WAS DEPORTED FROM THE U.S. Unlike some undiplomatic diplomats representing international organizations who have no scruples about betraying their political impartiality, U.S. ambassadors are well-trained and will always leave no stone unturned to assure the host country that they are not interfering in the internal affairs of countries. Therefore, the ambassador’s alleged statement that is being taken out of context must have been given within the context of diplomatic protocol, if at all he said them . Also, the ambassador may have made the statement within a context. The question that the ambassador was responding to must first be reported for one to understand why H.E. Mr. Michael Owens gave the answers allegedly being quoted by the SLPP newspaper. It is very likely that the ambassador may have been asked a question insinuating that the U.S. was taking sides in the present conflict in the nation over the selection of an extrajudicial killer by the SLPP for their presidential flagbearership. The U.S . has not denied Maada Bio a visa on the basis of his status as a presidential candidate of the SLPP. That was probably the message the ambassador wanted to convey. This is one of the basic flaws in news-reporting by SLPP newspapers. They deliberately distort AND fail to state the context under which statements were made. . In any event, the ambassador’s response should not be interpreted to mean that Maada Bio has been cleared to enter the U.S. This is because according to American Immigration Law, U.S. Ambassadors do not determine who is granted a visa by the U.S. Immigration. That decision is purely at the discretion of the consular officer.This has been emphasized many times by U.S Department of State officials .”Immigration law delegates the responsibility for issuance or refusal of visas to consular officers overseas. They have the final say on all visa cases. By regulation the U.S. Department of State has authority to review consular decisions, but this authority is limited to the interpretation of law, as contrasted to determinations of facts ” ( http://travel.state.gov/visa/frvi/denials/denials_1361.html ). Secondly, even if Mr. Bio is cleared by the U.S.Embassy in Sierra Leone, that is no guarantee that he will enter the U.S. . The Consular Officer at the airport could deny him entry at his own discretion or based on existing laws in the country that provide cause for certain categories of visitors to be barred entry. President OBama said last year that people who had been involved in human rights abuses in their countries would not be allowed to enter the U.S. Bio could fall foul of this law. And the Consular’s decision cannot be questioned by any authority. It is like the U.S. Police officer. He can pull over anybody and issue him a ticket, for careless driving for instance if the person commits the offence , and his decision cannot be questioned by any authority , not even a judge. New Jerseyans can recall the famous case of the State Prosecutor, Mr. Nicholas Bissel in 1995 . He was speeding to a jewelry store where an armed holdup had just occured leading to the shooting death of a women. Bissel was racing to the scene, according to him, to preserve the evidence , when a common police officer pulled him over and issued him a ticket for speeding. Mr. Bissel raved about the ticket and newspapers ran interesting commentaries and readers’ letters on whether the Police officer had acted reasonably . Bissel went to court to dispute the ticket but the judge upheld the decision of the police officer . The law works in America. The SLPP newspaper definitely misquoted the U.S. Ambassador when it said : “ He said that in fact Maada Bio has stayed in the United States of America for a while and was never deported to Sierra Leone “. It is very doubtful whether Ambassador Owens made this statement .With the manner that SLPP newspapers have been deliberately misquoting people and taking their statements out of context, it is not likely that Mr. Owens told anybody that Maada Bio was not deported from the U.S.
Maada Bio applied for asylum in America but his application was denied. An Iranian businessman called Mr. Bahman, who was Bio’s business partner and whom he had duped , appeared in court the day the application was to be discussed and complained that Bio had duped him of thousands of dollars and that he is a criminal and swindler who had also left Sierra Leone with loot he siphoned from public coffers. The judge duly denied his request for an asylum. This case was decided in Fairfax, Virginia . We challenge Bio to deny this because we have collected a dosier on him . Bio was also involved in domestic abuse case and was asked to leave voluntarily. He left before the expiration of the deadline. Probably, that was what the ambassador was referring to. Bio did not leave America in handcuffs like people physically deported but he was asked to leave all the same. It must also be emphasized that U.S. Consular officers do not usually discuss with the public the basis for refusing people visas. No. The consular officer will reconsider a case if an applicant can show further convincing evidence of ties outside the United States. Your friend, relative or student should contact the embassy or consulate to find out about reapplication procedures. Unfortunately, some applicants will not qualify for a nonimmigrant visa, regardless of how many times they reapply, until their personal, professional, and financial circumstances change considerably (http://travel.state.gov/visa/frvi/denials/denials_1361.html). Thus, if Bio’s circumstances change and it is the opinion of the Consular Officer that he could now be given a visa, it is possible for him to be issued one. Also, according to some usually reliable U.S. Political experts , in order not to be seen as interfering in the internal affairs of Sierra Leone, Bio could be granted a visa to visit with his supporters in the U.S now that he is a presidential candidate. But again that decision is purely at the discretion of the Consular Officer. 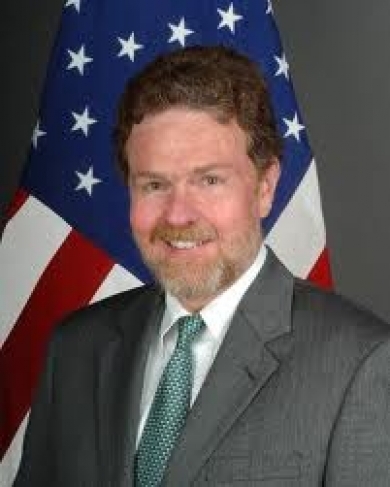 Salone Times – February 22 2012: The United States of America (USA) Ambassador to Sierra Leone, Michael Owen, has said that the Presidential hopeful of the Sierra Leone Peoples Party (SLPP) has never been prevented from entering the United States of America. He said that in fact Maada Bio has stayed in the United States of America for a while and was never deported to Sierra Leone and dispelled the rumors that Maada Bio was denied a visa to enter America. Michael Owen said that the US government will support anyone that wins the 2012 elections and also called for free, fair and peaceful elections in Sierra Leone. He also mentioned the United States’ responsibility to Sierra Leone as the Embassy is always giving Scholarships to Sierra Leoneans to study in the US so that they will come and contribute to the country. Meanwhile the former Executive Representative of the United Nations Secretary General Michael Schulenburg (ERSG) has accused the President of Sierra Leone Ernest Bai Koroma of declaring him persona non grata. This the government of Sierra Leone has denied in a press release. 6. Ernest Koroma’s lie to the public that he is an upholder of the rule of law whilst his regime’s perpetrates the politically motivated arrest and detention of political opponents on false charges whilst refusing his political prisoners bail in contravention of the Constitution of Sierra Leone, rule of the law and internationally guaranteed rights of human beings to belong freely to political parties of their choice and serve their conscience.